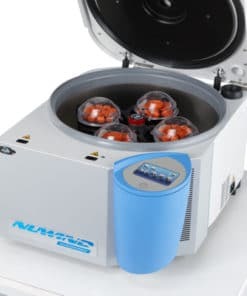 The Hettich Rotanta 460/ 460R high performance bench-top centrifuge For decades- ROTANTA centrifuges from Hettich have been distinguished by the highest quality AND the highest performance in benchtop centrifugation. They have responded to the fast-paced changes in laboratory environments with the continuous development of new technically outstanding solutions. Enhanced performance and an extensive range of accessories guarantee fast trouble free operation in daily laboratory use. With a maximum capacity of 3 liters per run; they are proving themselves in clinics and laboratory centers as well as in life science R&D departments. With its high throughput short separating times fully developed technology and a wide range of accessories the ROTANTA 460 model perfectly meets the requirements of modern life science laboratories. Maximum 6-446 RCF can be generated with a swing-out rotor. In swing-out position e.g. up to 120 blood collection tubes- 240 x 2 ml microlitre tubes- 4 x 750 ml bottles- 24 microtitre plates- 4 deep well plates with filter columns for RNA/DNA purification can be processed per run. 24-400 RCF is generated with an angle rotor. A choice of 3 angle rotors is available: max. 6 x 94 ml 6 x 250 ml and 30 x 1.5/2 ml. Infectious samples can be centrifuged safely for both the operator and environment. This is because this centrifuge is aerosol tight (TšV-tested in compliance with DIN EN 61010- part 2 – 020) and has autoclavable accessories that can withstand up to 121°C or 134°C. Programming the Hettich Rotanta is extremely easy. Entry of the parameters is fast and precise with selector keys on the foil keypad. During centrifugation the actual values of the parameters are displayed. Three complete running programs can be stored and recalled. Maximum user-friendliness is provided by the optional S control panel. With little manipulation a multitude of functions can be programmed via selector keys on the foil keypad and an adjusting knob. Up to 89 running programs can be memorized and recalled by their storing number. Models with the S control panel may be fitted with an interface for recording the centrifuging parameters with the data report system HETTINFO. All centrifuges of the Hettich ROTANTA 460 line feature automatic lid locking. The lid opens at the touch of a button after the centrifugation process. With the refrigerated Hettich ROTANTA 460 the temperature is within a controllable -20°C to +40° C- and accurate within 1°C. For sample processing in clinical chemistry- a wide selection of adapters are available to accommodate the most varied types of tubes. Biotechnology molecular biology and the pharmaceutical industry value the Hettich ROTANTA 460 especially for its autoclavable and aerosol-tight accessories. These versatile benchtop centrifuges feature many rotors including a microtitre plate rotor with a RCF of 4211 for purifying DNA / RNA. Hettich has been making cutting edge centrifuges longer than all of the top leading manufacturers. GMI carries Hettich centrifuges brand new in the box as our exclusive line for one simple reason…if you are buying new- Hettich is the best. It IS the Mercedes of the centrifuge world.